I woke up at 6:30 am. I was downtown by 8 am. It was a great day, nice and rainy. In the afternoon it stopped raining. I needed something to eat. 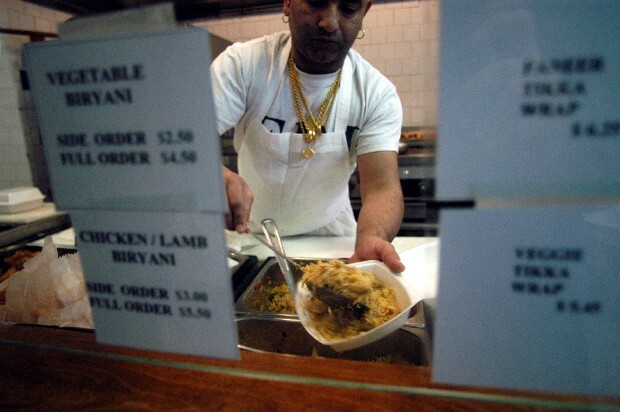 My former professor, Casey Smith suggested Naan and Beyond Indian Cuisine, 1710 L Street NW. He claimed "cheap eats." I met him at Swing's Coffee Shop and we were gone. I ate as much as I could, and then complained about the strange chicken pieces I found in it. I guess this place doesn't know what pieces of chicken people like to eat. I would go back, but I'd stick to the vegan stuff. We had a good sports photo class tonight. Our guest speaker was Washington Post photographer John McDonald. It was a great presentation. I was soo ready to get home tonight I unbuckled my belt as I turned the corner to walk down my street. I guess that would be nearly equivalent to taking your shoes off when you get on the bus after a long day.